Dr. Samuel “Sammy” Joseph is the son of Richard ‘John’ Joseph and Yolande Joseph. He completed his PhD in Physics at Baylor University in 2009 and was faced with a major dilemma. Should he stay in America and try to use his talents to enrich himself or return to Montserrat and contribute to the society that provided the foundation for his academic success. 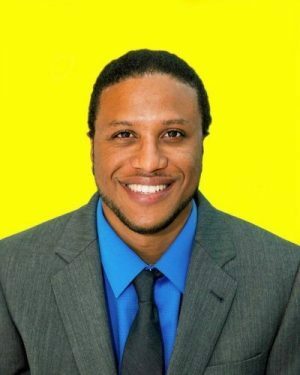 He believes his schooling in Montserrat allowed him to obtain first class honors in Mathematics at The University of the West Indies, Cave Hill Campus in Barbados. The teachers at the St. George’s Primary School and the Montserrat Secondary School were the ones that instilled the discipline that allowed him to complete his Masters in Computational Physics at the same institution. In 2001, he was one of ten students accepted into the High Energy Physics postgraduate Diploma programme at the prestigious ICTP institution in Trieste, Italy. In 2010, Dr. Joseph returned to Montserrat and during the next four years, taught Mathematics and Physics both at the Montserrat Secondary School (MSS) and the Montserrat Community College (MCC). He was the staff sponsor and debate coach for three years at the MCC. Through the students’ hard work and preparation, Montserrat captured the Leeward Island Debating competition title in 2014. He, along with his brother, Daniel Joseph, and Manish Valechha, established Montserrat’s first software company, Lavabits. He currently has various business interests on island and is a contributor on the popular radio show View Point.